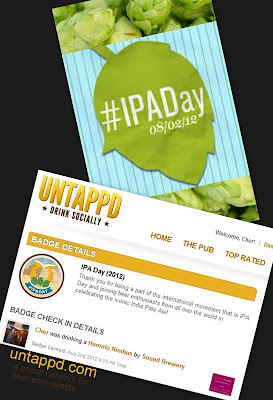 August 2 is International IPA Day. A day when beer enthusiasts all over the world raise a glass of hoppy goodness in honor of a style of beer the is well known and loved: India Pale Ale! So in honor of this auspicious occasion I, of course, had to indulge in an IPA. And I didn't want just any everyday, run-of-the-mill, ordinary IPA. I wanted a special one. I acquired a beer that cannot be obtained in Connecticut by ordinary means. In fact, I went to great lengths to get a beer that not only is award winning but is so locally distributed that it's nearly impossible to get outside the brewery's area. And that beer is? 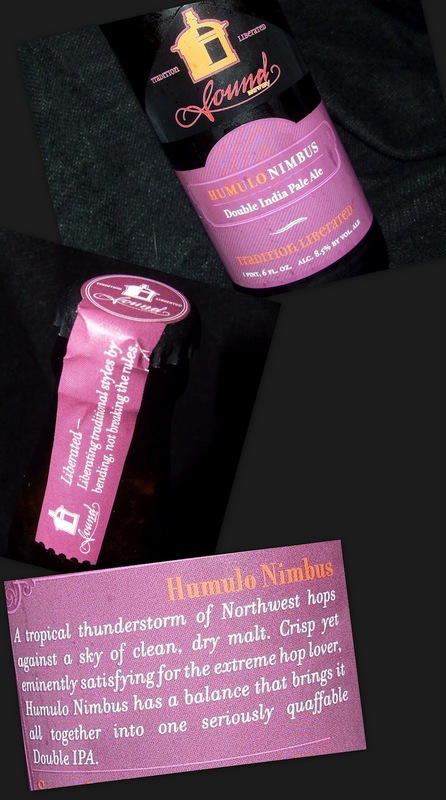 Humulo Nimbus by Sound Brewery. Sound Brewery is located in Puget Sound region of Washington State. Which, I might add, is a beautiful place to visit! Humulo Nimbus, which gets it's name (in part) from the scientific name for hops humulus lupulin, is a double IPA that comes in at 8.5 ABV and 75 IBUs. It pours a hazy reddish gold with little to no head. I was immediatly struck by a wonderful hoppy pineapply aroma that made my mouth water. I knew right away that I had chosen a worthy beer to celebrate IPA Day. The flavor of this beer is impressive . . . nicely bitter and slightly sweet all at the same time . . . tropical fruits, bitter hops, a little caramel, a touch of vanilla that all meld into a mouthful of YUM. It is full bodied . . . not quite heavy . . . but the citrussness (is that a word?) make the beer refreshing and very drinkable (dangerously drinkable). It finishes fairly clean with a touch of bitterness at the back end. My overall thoughts on this beer? I would drink it anytime anywhere and why-oh-why can't I get it on the East Coast? Am I a fan of Sound Brewery? Hells ya! If you are outside the distribution area of the Sound Brewery, Marina Market will ship to most states . . . for a price. 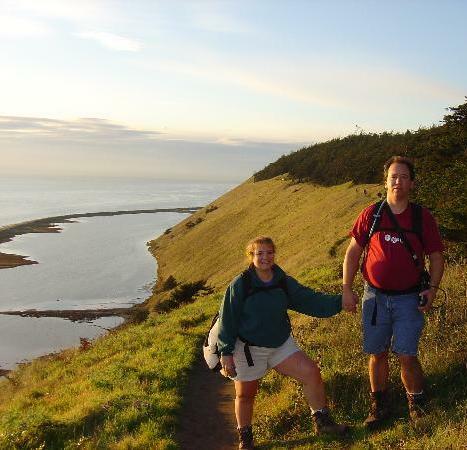 Hubby and I during a 2004 visit to Seattle and the Pugent Sound. This photo was take at Ebey Bluffs on Whidbey Island. Beautiful! If only I'd known about Sound Brewing then! Don't feel bad, the brewery is only about 2yrs old, we didnt miss them last time out there. I always wondered where that name came from.